The collagen hybridizing peptide (CHP) is a novel and unique peptide that specifically binds unfolded collagen chains, both in vitro and in vivo. [1,2,3] By sharing the Gly-X-Y repeating sequence of natural collagen, CHP has a strong capability to hybridize with denatured collagen chains by reforming the triple helical structure, in a fashion similar to DNA fragments annealing to complementary DNA strands. CHP is extremely specific: it has negligible affinity to intact collagen molecules due to lack of binding sites, and it is inert towards non-specific binding because of its neutral and hydrophilic nature. CHP is a powerful histopathology tool which enables straightforward detection of inflammation and tissue damage caused by a large variety of diseases, as well as tissue remodeling during development and aging. 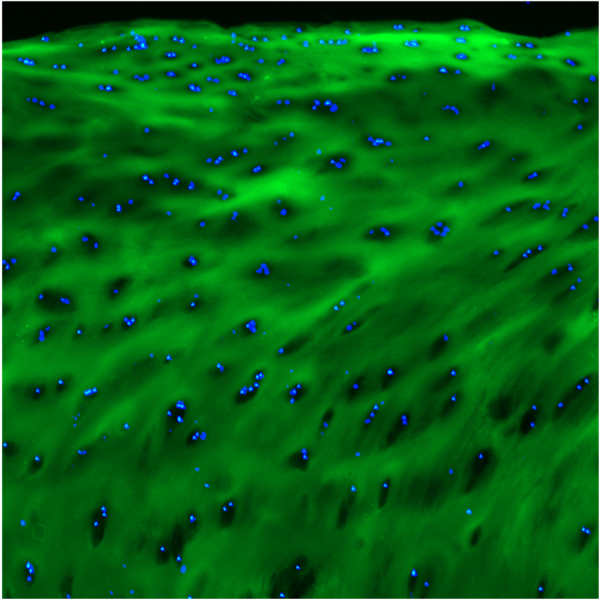 CHP robustly visualizes the pericellular matrix turnover caused by proteolytic migration of cancer cells within 3D collagen culture, without the use of synthetic fluorogenic matrices or genetically modified cells. CHP can measure and localize mechanical injury to collagenous tissue at the molecular level. It also enables assessment of collagen denaturation in decellularized extracellular matrix. In addition, CHP can be used to specifically visualize collagen bands in SDS-PAGE gels without the need for western blot. F-CHP is labeled with fluorescein for direct fluorescence detection. For research use only. Not intended or approved for diagnostic or therapeutic use.